What they look like: Coyotes are distinguished from domesticated dogs by their pointed, erect ears and drooping tail, which they hold below their back when running. The coloration of coyotes varies from grayish brown to a yellowish gray on the upper parts. The throat and belly are white. The long tail, which is half the body length, is bottle shaped with a black tip. Coyotes are members of the dog family (canids) which includes wolves, jackals, coyotes, dogs, and foxes. Coyotes are found throughout North and Central America. They range from Panama in the south, north through Mexico, the United States, and Canada. Coyotes are present and common in most of Washington except the islands, and has been seen recently on Bainbridge and Whidbey. Prefers open habitat and forest edges and readily uses open forests and extensive burned or clear cut areas. Found in agricultural lands, and at the edges, and sometimes well into developed areas including cities. Click the range map to learn more about the distribution of Coyotes in Washington. What they eat: Coyotes are carnivorous (eat meat) -- they eat primarily small mammals, such as eastern cottontail rabbits, thirteen-lined ground squirrels, and white-footed mice. They occasionally eat birds, snakes, large insects and other large invertebrates. Coyotes can live in a variety of areas since they will eat almost anything, including human trash and household pets. Behavior: Coyotes are nocturnal predators, but can occasionally be seen during daylight hours. Coyotes are capable of running at speeds up to 65 km/hr and they can jump horizontal distances of up to 4 meters. Coyotes are less likely to form packs than are wolves, so they usually hunt individually, in pairs or small family groups. Coyotes are resourceful. They are capable of digging their own burrows, but they often enlarge the burrows of woodchucks or badgers to use for their dens. 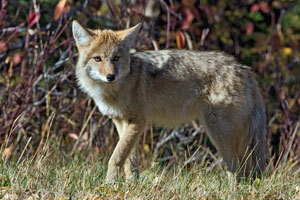 Reproduction: Coyotes mate between late January and March. Once the female chooses a partner, the animals may remain paired for a number of years. Young are born after a gestation of 60 to 63 days. Litter size ranges from 1 to 19 pups (the average litter size is 6 pups). They usually breed once each year. Coyotes can mate with domestic dogs and occasionally with gray wolves. Lifespan/Longevity: Coyotes have been known to live a maximum of ten years in the wild and 18 years in captivity. The young are born blind and open their eyes after 10 days. Coyotes live up to 10 years in the wild. They can jump horizontal distances of up to 4 meters.